Touring the new Whitney, I thought about how Hurricane Sandy has inadvertently seeped into our collective thought processes about how to live in this city on a practical level. How since we are ultimately at the mercy of nature, perhaps we are better off going with the flow, or at least learning to live within its foreseeable dictates rather than building a fortress against it. Thus the Whitney building, designed by Renzo Piano, seems at every chance to embrace the outdoors. Numerous doors lead to vast terraces with sculptures. There's an outdoor staircase, an alternative to an interior one (albeit bestowed with great river views) or a set of elevators with whimsical designs by Richard Artschwager. From nearly every point, it's possible to see daylight, and in a few steps, be outside. It's a stark contrast to the interiority of the stately Breuer building, a veritable cocoon, albeit welcoming in a different way. The new building uses reclaimed pine flooring, which goes a long way toward warming up the galleries. The fact sheet about the new building includes a substantial section on flood mitigation. And while most of the points in this section discuss enhanced waterproofing and flood gates and barriers, the main lobby could conceivably open its many glass doors and simply let the storm surge pass through without much damage to the art, while the bulk of the museum hovers safely above. This might well apply to the hordes that will surely descend upon the museum, funneled neatly from the popular Highline. This 1.5 mile promenade—the latest, hottest city park—has pioneered the idea of re-use and has embraced urbanity while providing a place to bask in some sunshine and fresh river-borne air. 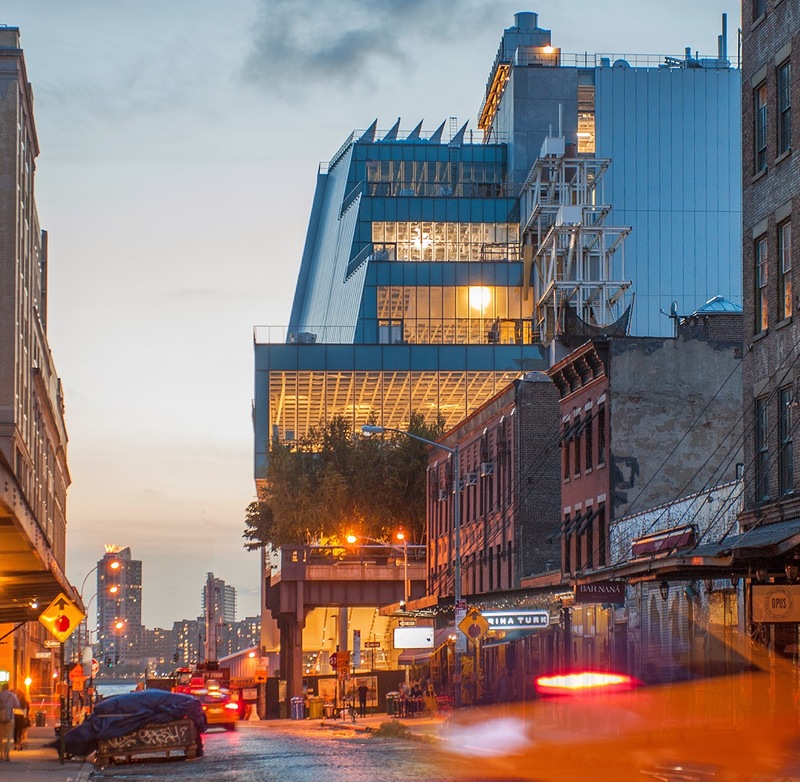 Pedestrians will pass through the Whitney just as they pass through Meatpacking and Chelsea, a flow of humanity soaking up the sights. There are fewer and fewer barriers between inside and out, in a way that is perhaps unprecedented in the city. It's quite possibly the opposite result one might expect from the apocalyptic scenario of Hurricane Sandy. 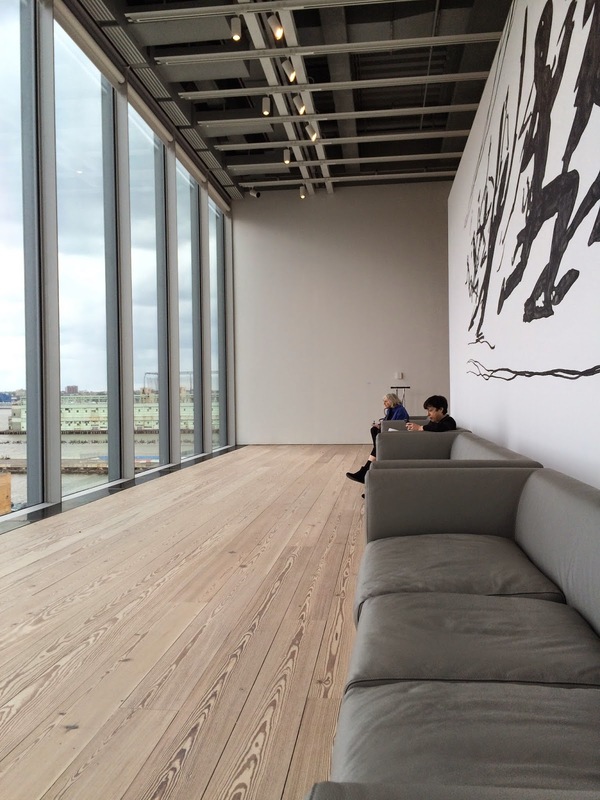 couches on the river side of a gallery wall. 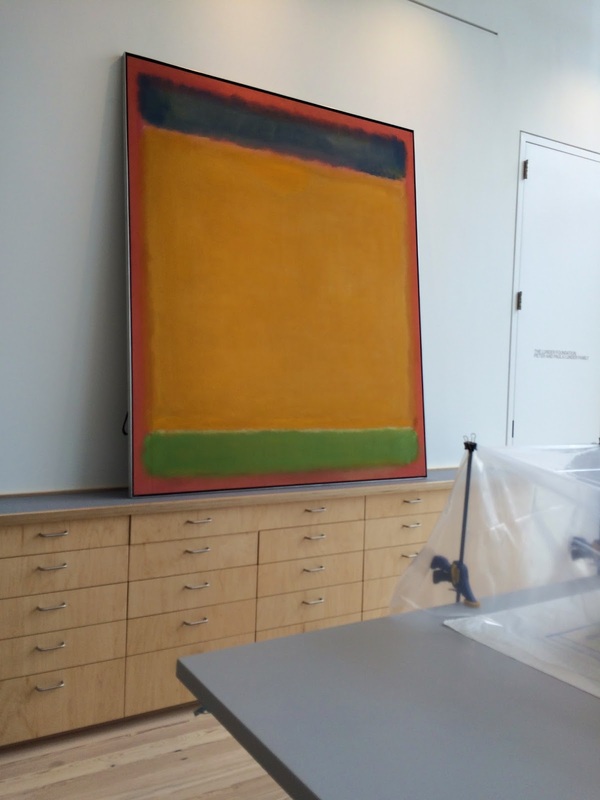 A Rothko observes the conservation studio. The inaugural exhibition, America is Hard to See, is a well-organized, 23-section reason to view legacy artworks from the collection—many old friends—such as Hoppers and O'Keefes with work from recent generations, grouped chronologically. Around 400 artists are represented; it's essentially a roll call of luminaries from the last century or so. Of course, it's not without holes—Mary Heilman created an installation for a terrace primarily comprising dozens of brightly colored chairs, but as a friend pointed out, her glorious paintings are not included in the interior exhibition. 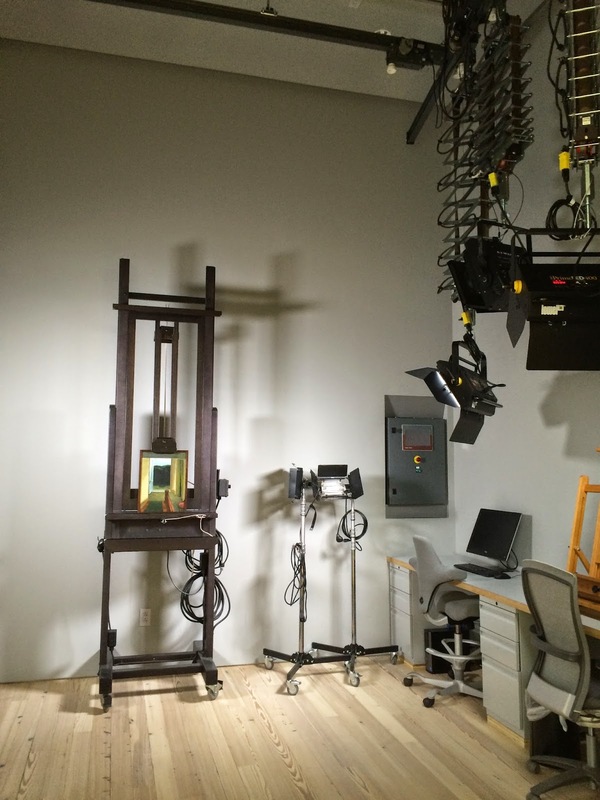 Studio for photography and documentation. Adding to the air of openness, the museum allowed access to chambers normally not closed to the public, such as the conservation studio, where a Rothko stood waiting patiently, vying for attention with the demanding vista of river, and a slate-hued documentation room with its equipment poised to work. There's an education center, a theater, special project rooms, and cafés. A light sculpture by Felix Gonzales-Torres hangs in a lower interior stairway that leads from the ground floor up. There's a balcony on a landing from where one can observe the busy lobby, a large open space containing the shop and a restaurant. It's a human-scale iteration of the terrifying Atrium at MoMA, where looking down from the upper floors can feel like a suicidal siren call even to those of us unafraid of heights. The Whitney is a friendlier place that embraces the city in a fresh way that might only be possible in the wake of the floods of Sandy and the repurposed Highline. It's a seismic shift to Meatpacking that was largely solidified by Chelsea becoming the center of the art world over the past decade. Welcome to a new art paradigm for New York City.